Each of us have the entire blueprint for our bodies contained in every cell, and the same is true of plants. This information is stored in the form of an extremely long molecule known as DNA (in human cells its length is ~6 feet). Studying and understanding DNA in plants has led to many advances in weed science including; the development of herbicide- tolerant crop varieties, understanding the causes of herbicide resistance and understanding the origins and spread of weeds in our environment. 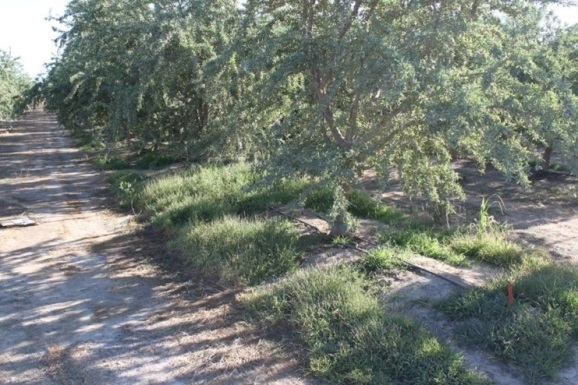 Resistant junglerice growing in an almond orchard. Photo courtesy of Marcelo Moretti, UC Davis. Here in California, the weed science group at UC Davis is utilizing this technology to investigate glyphosate resistance that has been detected in California populations of junglerice. Junglerice is a summer grass weed present in many cropping systems in the Central Valley. Understanding the elements that are causing this resistance, and how it may be spreading, will help scientists and weed managers develop and improve weed management practices in these systems. A common mechanism for resistance to glyphosate in weeds is a change in the DNA sequence that codes for the target protein of the herbicide. The target protein of glyphosate in plants is 5-enolpyruvylshikimate-3-phosphate synthase (EPSPS) and the change in DNA is a result of a naturally occurring mutation in the gene sequence. This mutation causes a small change in the shape of the protein which prevents glyphosate molecules from binding, allowing the plant to continue to produce proteins and survive application. Using molecular genetics tools to sequence and analyze the EPSPS gene in plants, we can detect if the EPSPS gene is the normal “wild type” or if alternate sequences (i.e. gene mutations) are present. When we look at this gene in junglerice populations collected in California, we find that all of the resistant populations contain a mutation and the susceptible ones do not. Interestingly, we found three different types of mutations among our populations of junglerice. This gives us important information about how the resistance started and how it may have spread. The repeated use of glyphosate on weeds imposes “selection pressure” that will slowly shift the populations to contain a higher proportion of resistant individuals. A single junglerice plant can produce up to 40,000 seed, so it doesn't take many generations for resistance to build up in the population. 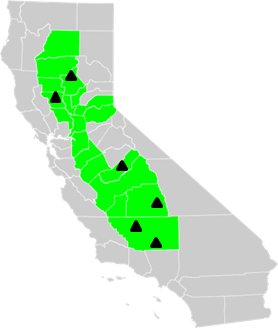 To determine if the resistance we have found in junglerice in California is a result of a single evolutionary event followed by escape and spread we first look at populations that are in close geographical distance to each other. If one plant had become resistant, and its progeny spread into nearby areas, we would expect to see the same mutated EPSPS gene in all the plants. Instead, our research shows that we have several different mutations which tells us that glyphosate resistance has evolved multiple times independently in the same field or region. The next step is to compare junglerice populations that are greater distances apart. If a resistant plant's seed was spread through long distance movement such as contaminated seed stock or on machinery, we would expect to see the same EPSPS gene mutation in most populations. However, we found that the EPSPS genes in resistant plants collected large distances apart often are different. This also suggests that glyphosate resistance has evolved independently multiple times in California and, although seed movement can also spread resistance, this is likely not the primary cause in the populations we tested. Looking at this junglerice genetics information in a management context, the use patterns (frequent applications) of glyphosate in weed management are clearly selecting for resistant plants. This is evident in that the resistance we've observed in junglerice has occurred independently in different cropping situations across the Central Valley. These findings support a shift toward integrated weed management, with the use of multiple herbicide chemistries in a weed management program coupled with non-chemical approaches where feasible, in order to reduce this selection pressure and control escapes before a large seed bank can be built up. The technology to study the genes of plant species has given weed scientists new tools to understand the origin, causes and spread of herbicide resistance. In the future we will continue to use these tools to understand many more aspects of weed science to help improve management strategies for growers in California and around the world. thank for the posting. I would like to make 2 points about this. There obviously is a lot of interest in herbicide resistance and its effects. It seems pretty obvious that herbicide resistance is a symptom of a problem that we need to deal with. Do we manage herbicide resistance by studying its spread and mechanisms? Or should we be studying systems where herbicide resistance does not occur and learn why it does not occur there. 1. Herbicide resistance is a result of lack of diversity in weed management (Shaner & Beckie 2014 Pest management Science 70:1329-1339). California vegetables have diverse and redundant weed management systems and have stability in the system. Redundancy needs to be introduced into the WM system for perennials. if we don't look we won't find. 2. Herbicide resistance is a result of over dependence on a short list of herbicides. Public weed scientist keep saying "we need new herbicide mechanisms". But wishes won't make it so. New chemistries cost $300 million and there will be few coming out in the future. I will continue to argue that searching for diversity in weed control methods should be of a much higher priority than description of herbicide resistant weed populations. Weed science is a discipline with broad range of research topics - genetics is one end of the spectrum. Other weed scientists focus on biology, population dynamics, chemical control, non-chemical control, robotics, sensors, identification, etc. Weeds are diverse, plastic, and responsive at the population level to the selective forces imposed by agriculturalists or the environment. Seems like there's room and need for the range of scientists and scientific approaches that address weed issues. I find that looking at the underlying genetics of any problem is part of devising a system of control / production and the deployment of our available tools. I agree that there is a very short list of herbicides available. I might argue that the short list is not just the 300 million dollar price tag but it is also the result of a structure with an over dependent on private research guided stockholder returns. It is stockholder returns and profit that drove putting Round Up resistance in every crop and over use ... not good science. I agree that systems study is crucial but having the elements of picture remains important. Having this data on the ease and frequency of mutations possibly makes the argument stronger next time to look at the system and not just a component. Maybe the picture we need to hold and the arguments we make as scientists is broader than we realize.